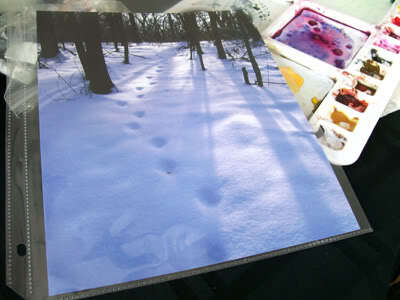 Home » Watercolor and Pastel Painting Demonstration – Let’s Paint Winter Woods! About three years ago I went hiking at Bull Frog Lake, right before evening in January. I came upon a scene that made me pause for a moment and fall in love. Winter’s intense setting sun was casting long shadows from the trees in the woods. Right on que it seemed, three crows in the distance began to caw. I almost wanted to cry. Call me a fool for nature, but West Nile almost eliminated all the crows in my area and I haven’t heard that beautiful, “CAW, CAW, CAW”, in a very long time. They are my 2nd favorite bird in the world. Step 1: I am using an Ampersand Pastelbord 16×20. 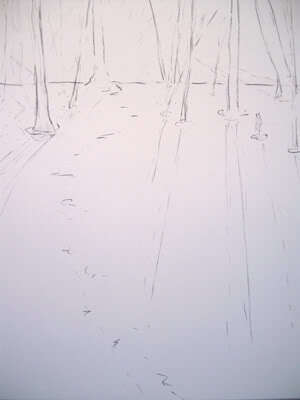 This is going to be a watercolor and pastel painting. With charcoal, make a simple sketch before you paint. Remember the 3rd’s rule…great composition happens in thirds. Notice my horizon line is 1/3 from the top. My deer tracks will be 1/3rd from the left. Here is my reference photo. I had it enlarged and printed at 8×10. Notice I have a clear plastic cover on it. This will help you greatly! I am a very messy painter and get junk all over the place (and I don’t care…it’s part of the process), if I didn’t protect the picture it would have been destroyed. Step 2: Turn your board upside down. This will help the paint flow down with gravity. Spray the sky with clean water. 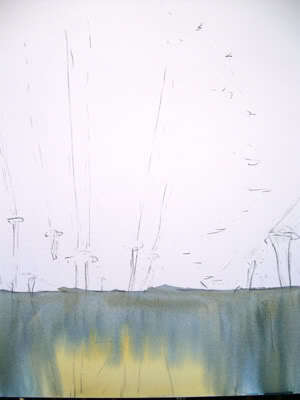 Using watercolor paints, paint Naples yellow in the sky (remember we are upside down so it is at the bottom). Next, with a mixture of ultramarine blue and burnt umber, paint some distant trees using up and down strokes. Step 3: When dry, paint some far trees using ultramarine blue and a lot of water so the mixture is not dark. Paint closer trees using a darker mixture of ultramarine blue and burnt umber. 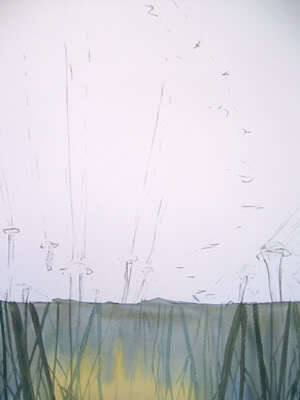 Here is a close-up of the distant trees. 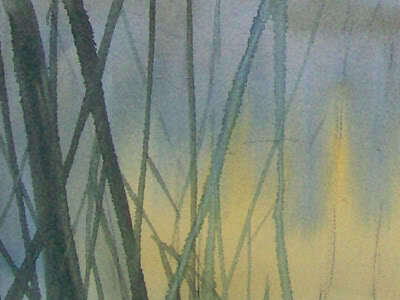 I love how the watercolors spread out at the edges representing rough bark…YES! Effortless painting! Step 4: When completely dry, turn your board right side up. In this step I am just laying down big blocks of color using watercolors. I am only using cobalt blue, ultramarine blue and alizarin in different mixtures. You might be thinking, “Are you nuts? Those colors are so dark!” Don’t worry, most of this will be covered by pastels. Step 5: With sap green, ultramarine blue, and alizarin crimson, make a black mixture and paint the closest trees. Try to vary their sizes. That took me a long time to accomplish in my early years of painting. Your brain just wants to make trees, so after a while you realise they are all the same thickness. NO! In nature they are all different. Step 6: We are done with watercolors. When everything is dry, start painting with pastels. 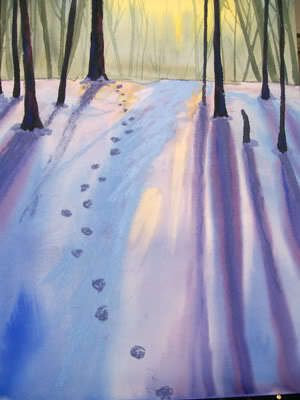 I used a medium Unison purple for the tracks and shadows and a medium blue for snow. Step 7 Final: Make layers and layers of snow, using three different light blues. 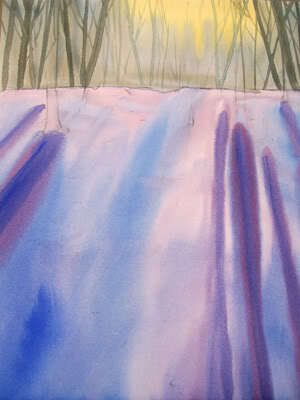 I also used light purple for the snow as well. On the tree trunks I painted spots of deep dark purple and fuchsia. You can’t really see it, but it is there. 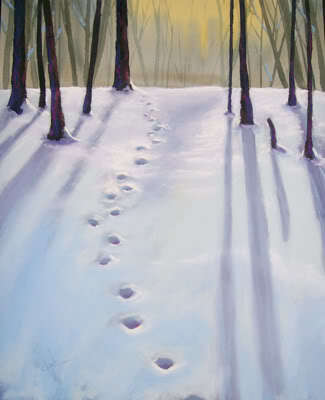 I also painted tiny spots of yellow in the snow to reflect the setting sun. Don’t worry if you do not paint with pastels. You can use the same principles to paint with oils. It’s all about layer upon layer. This painting will be on display at the LaGrange Art Gallery March 2010. I hope you enjoyed this step by step painting demonstration on how to paint a winter scene in the woods using watercolors and pastels. My name is Mark, I just wanted to say this painting is amazing. I am a self taught artist and love to check out the demonstrations on this site, I love art and love to paint and draw, although I don’t get a chance to do much of it, It hard for me to afford supplies which is really disapointing at time. Someday I’d love to be as good as Christine Kane if things change for me financially and i get to purchase supplies to practice my art. Please keep up the good works and again thanks for including me in your newsletter. wish I had paintings as good as this. Please keep showing these fabulous demos. I love seeing the techniques artist use. It’s fascinating to see you use such bold colours in your layers. I describe similar techniques on my blog. Wow this is a truley amazing painting. I understand what you mean when you heard the crows “cawing”. I live out in the sticks and find this sound real calming and close to nature. I love the way you have built this painting up. A really useful tip with the plastic cover for the photograph. WOW! that is so lovely and soooo clever. The step between 6 and 7 is amazing. I am used to producing designs on a screen – I can move through the layers and change things if I make a mistake but there is something of a higher skill involved in what you have done. Thanks for sharing! Awesome tutorial on pastel work. I am also a self taught artist and I have always liked pastels but have not yet mastered it. I mainly oil paint the proces is very similar with the layering. Bravo! It’s no easy task to really capture the beauty of nature on a canvas. So many great tutorials here for self taught artists, awesome. I wanted to say that it’s nice and beauty. Amazing painting! Tis really inspiring. I am not a good artist but I love it. I love painting. 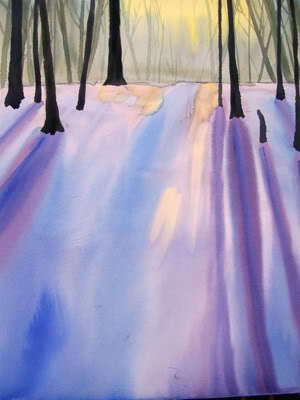 I love how the watercolors and pastels blended well with each other with this winter painting. And I highly commend this one-of-a-kind online tutorial that talks no nonsense, just straight to the fact details about art and simple painting. Bravo! I will make time because I want to try the snow scene. Not painted watercolour and pastel to gether. Thank you so much for doing this demo. Great painting! I have never mixed media. Can’t wait to try this. This is an amazing demo. Presently I am painting a winter scene and have found your method of blocking in the snow first with darker blues and then over it with light blues useful. I too paint in layers using Pan pastel first and then water colours. I am Intersted to find out which brand of pastel you used and do you use it wet?